The Lifting AllDolly provides the ability to lift and lower most appliances. Based on the same patented design as our famous Standard and Expandable AllDollys. Call or email to order this Lifting Alldolly. Please call or email us to order this Lifting AllDolly. NOTE: This product is currently Back Ordered. Please contact us PRIOR to purchase. The Lifting AllDolly is based on the same patented design as our famous Standard and Expandable AllDolly’sbut with an added drive system that provides the ability to lift and lower most appliances. 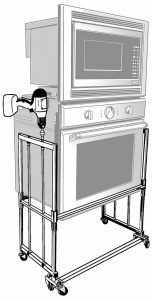 There are two 1/4″ hex drive points (one on either side) so you can drive the system with your power drill from either side should one side become obstructed, use the flexible design of the AllDolly to raise and lower just about any oven or other appliance to or from height! The Lifting AllDolly currently comes in two widths. This model has a maximum working width of 36″ inches. Weighs about 45 pounds. This product is becoming quite popular since single and double ovens continue to grow in size and weight. With either width the Lifting AllDolly will save huge amounts of wear and tear on you or your technicians backs and arms and are particularly useful when doing installations. The Accessory Forks provide the ability to lift your appliance directly from floor level.